Time to check this year’s resolutions – have you kept your promises, even over-delivered on your goals? Your accomplishments, both small and big victories, should be rewarded. Get the home entertainment upgrade you’ve always desired and be rewarded for it, as Samsung brings the “Big Score in 11 Stores” promo. From November 30 to December 4, score big savings and premium rewards when you buy select Samsung TVs, such as Samsung Curved SUHD, SUHD, and UHD, in 11 Samsung dealers nationwide. 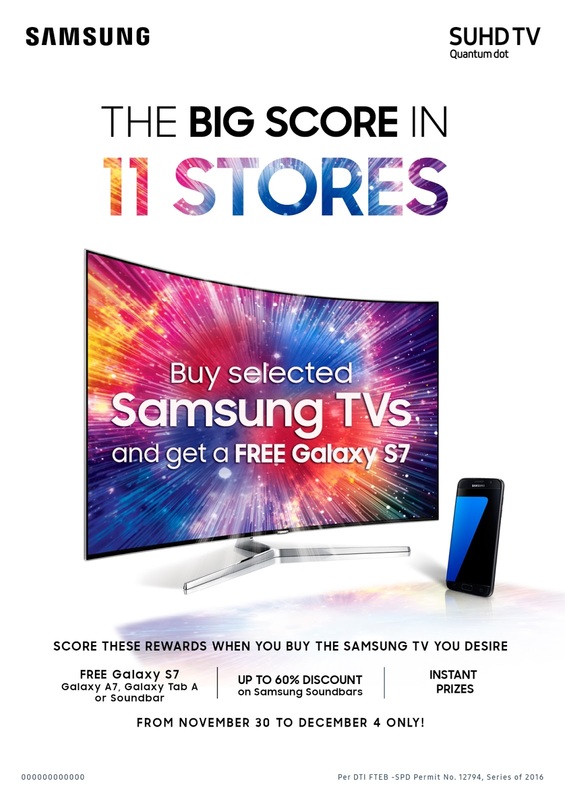 · Take home a free Samsung Galaxy S7, Galaxy A7, Galaxy Tab A or Samsung Soundbar. Select Samsung TVs will let you own powerful gadgets, such as Samsung Galaxy S7, A7, or Tab A that can help you work smarter, or a Samsung Soundbar to complete the upgraded entertainment experience. · Enjoy up to 60% discount on Samsung Soundbars. This year, transforming your entertainment room to a cinema -like zone can become a reality. Pair your Samsung SUHD TV with a Samsung Soundbar, Curved Soundbar, or Dolby Atmos Soundbar to bring home the cinema experience. Beautiful inside and out, these Samsung Soundbars will prove why they are better than typical home theater systems and perfect pair to your Samsung TVs. · Win other premium surprises. Lastly, Samsung SUHD TV buyers will get a chance to win other Samsung premium items. This includes the Samsung Wireless Audio 360 R1 to enjoy a 360 perfectly balanced sound or Del Monte Christmas Packages to add to the Christmas fare. The participating dealers are SM Appliance in SM Megamall; Abenson in Ascott Bonifacio Global City; Automatic Center in SM North EDSA; Anson’s The Link in Makati; Robinsons Appliance in Robinsons Magnolia in Quezon City; Savers Mall in Balibago, Pampanga; Addessa Galleria in Urdaneta, Pangasinan; First Family Appliance in Parkmall, Cebu; Metro Plaza in Gaisano Mall, Davao; Imperial Mega Showroom in Iloilo; and Solidmark in Limketkai Mall, Cagayan de Oro. End the year strong on a happier note and inspire the family to do bigger things next year with these rewards. For more details, visit the Samsung Facebook page or log on to samsung.com/ph/offers.